Dreams do come true! Join Mickey, Minnie and a cast of over 25 of your favorite characters on a magical journey that all starts with a wish. Prepare to be captivated with amazing scenery and the most beautiful gowns fit for a princess as Snow White, Belle and Cinderella all search for their true love. Super Heroes Unite in Marvel Universe Live in So Cal! Disclaimer: We were invited to see Disney! Live all opinions are my own. This was our first time experiencing Disney Live! Being it was my daughters birthday weekend, it was perfect timing to see the show and wow did she ever enjoy it! From start to finish the show was engaging and kept my girl entertained with the very popular stars of the show Goofy, Donald Duck, Minnie, and Mickey Mouse as well as the additional characters along the way. The mini re-enactment of the stories Aladdin and The Little Mermaid were a multi-media presentation including props, videos and performers along with singing and dancing to tell the tales, it took you right into the story. Aladdin with his flips and bounds and Princess Jasmine so gracefuly beautiful both flew around their new world along with genie and their magic carpet for a wondrous and mystical re telling of their story. The Little Mermaid's sisters came and did a number with Sebastian and as normal for Ariel she was late And no where to be found! Ariel was busy making her deal to be a human with Ursula so she could be with her Prince Eric. In the lagoon with the help of a few friends she gets just that and regains her voice too. A Toy Story's Little Green Men, Buzz Light Year, Woody, Jessie and Bullseye joined in to interact and dance with the audience as well as play with large inflatable intergalactic planets that were bouncing around in the auditorium, it was an out of your seat dance party that had the kids laughing and dancing away. The finale brought out all the characters in a last song and the show went out with a bang! With a short intermission between acts, the performance time was perfect for children of all ages, so much fun and such a great way to get in a Disney fix for the kids! Did you go this past weekend? If not There is still time to see the show! I was provided tickets to the show to facilitate this review, all opinions are my own. Disney Live! Mickey’s Music Festival, featuring an all star line-up of more than 25 Disney characters, begins with audiences watching a state-of-the-art video projection of the frenzy backstage which spills onto the stage as Mickey welcomes guests to his concert tour. Soon thereafter, they will be transported to a new world of hip hop beats, dizzying acrobatics, flying carpets and magical transformations with Aladdin, Jasmine and Genie. Underwater is where the crowd will meet up with Ariel, Sebastian and their nautical pals to groove to the reggae rhythm. 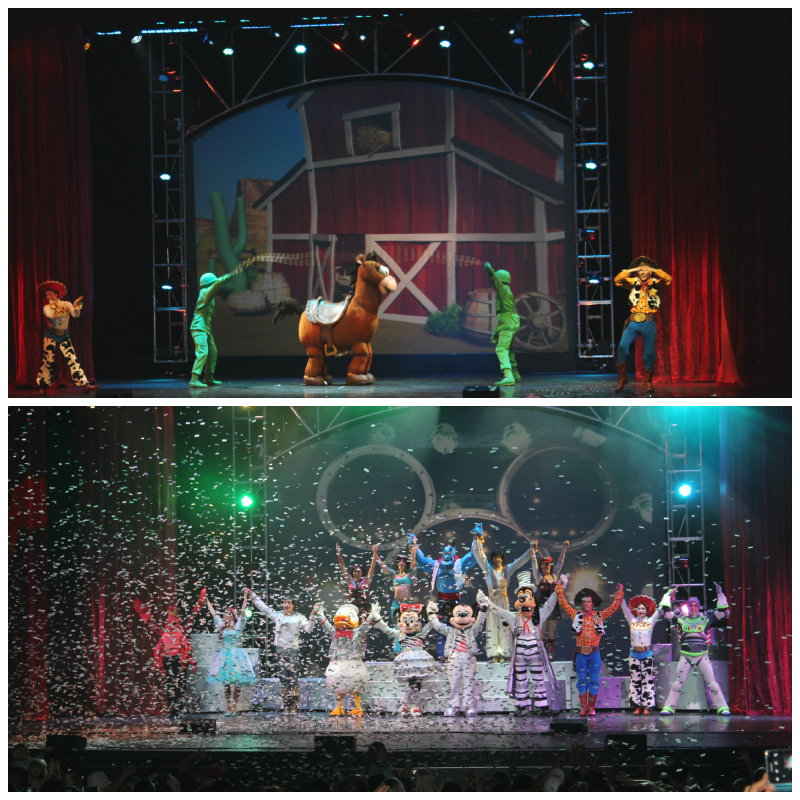 And family and friends will stomp to the beat as Woody, Buzz and Jessie teach them how to boogie rodeo-style.